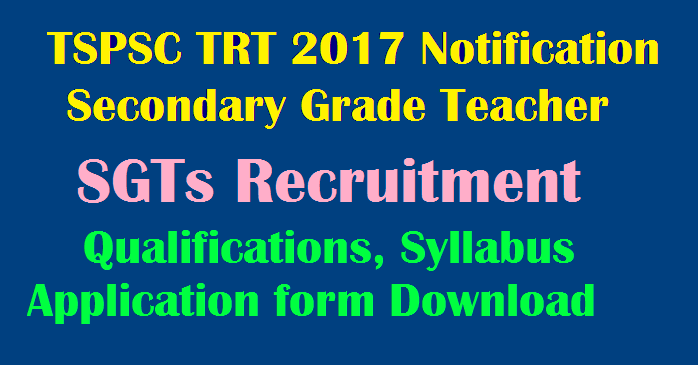 Telangana Teachers Recruitment Test Notifiction for Secondary Grade Teacher Posts Eligibility Criteria Vacancies Break up Educational Qualifications Syllabus pay Scales How to Upload Online Application Form | TS DSC TRT 2017 Notification for Secondary Grade Teachers in School Education Department of Telangana Government | The candidates matching educational Qualifications may Submit Online Application Form at TSPSC Official Website. TRT 2017 Notification SGT Secondary Grade Teacher Recruitment Qualifications Syllabus Download @tspsc.gov.in Telangana Teachers Recruitment Test Notifiction for Secondary Grade Teacher Posts Eligibility Criteria Vacancies Break up Educational Qualifications Syllabus pay Scales How to Upload Online Application Form | TS DSC TRT 2017 Notification for Secondary Grade Teachers in School Education Department of Telangana Government | The candidates matching educational Qualifications may Submit Online Application Form at TSPSC Official Website. 1 Secondary Grade Teacher i) Must Possess Intermediate / Senior Secondary (or its equivalent) as recognised by the Board of Intermediate, Telangana with at least 50% Marks (In case of SC / ST / BC / Differently abled candidates, the minimum marks shall be 45%) and Pass in 2- year Diploma in Elementary Education / 4-year Bachelor in Elementary Education. Aadhar number, Educational Qualification details i.e., SSC, INTERMEDIATE, DEGREE, POST GRADUATION etc. and their Roll numbers, Year of passing etc. Community/ Caste Certificate obtained from Mee Seva/ E Seva i.e., Enrollment number and date of issue.